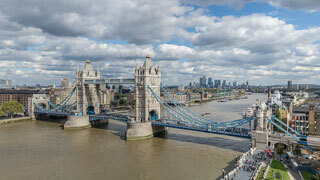 Tower Bridge is a combined bascule and suspension bridge in London built between 1886 and 1894. The bridge crosses the River Thames close to the Tower of London and has become an iconic symbol of London, resulting in it sometimes being confused with London Bridge, situated some 0.5 mi (0.80 km) upstream. Tower Bridge is one of five London bridges now owned and maintained by the Bridge House Estates, a charitable trust overseen by the City of London Corporation. This article uses material from the Wikipedia article "Tower Bridge", which is released under the Creative Commons Attribution-Share-Alike 3.0 License.